My experience with the Marpet style RAM upgrades is that the MMU header can often displace the connectors in the MMU socket, and in fact I had exactly this issue on exactly this model of mainboard not long ago. One part of the puzzle with this particular board is that the MMU is actually fitted the OPPOSITE way around to other boards I have, in other words, it's a 180 degree flip, so when installing the MMU adapter for the RAM upgrade, you also need to flip that 180 degrees too. That had me foxed for a few moments unti I noticed it was different to other motherboards in my collection. I also ended up having to do a complete reflow of every last solder joint on the MMU and Shifter adaptors, and also the SIMM board. Once that was done, everything sprang into life with 4MB of RAM . My advice though, is to get the board working with just it's 512kb of ram to begin with. Put everything back to factory normal before even trying to get it going with the RAM upgrade. So sort out the resistors, clean the MMU pins, check all the MMU socket pins are good, clean them, clean the MMU chip pins, and reinsert, rembering that the orientation is 180 degrees out on this mainboard, so line the dot on the MMU up with the dot on the socket to be 100%. If the mainboard won't work in standard guise, trying to troubleshoot with extras attached is going to be a lot harder. The Marpet upgrade is entirely out, apart from the soldered socket over the shifter chip that you can see in the photos from earlier. Today I resoldered the resistors, and since my last post I popped out the Glue and the MMU chips and I didn't see anything obviously out of alignment in the 60 seconds I spent there. But maybe there's something more nuanced that my eye isn't trained to see on these chips. Just how sensitive are they? 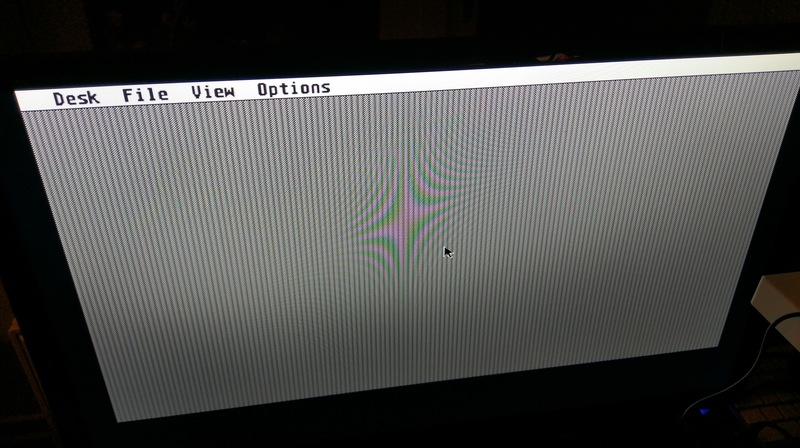 The Marpet instructions seem to point to the MMU for "black screen" boot failures. But if I were to doubt myself, I'd think that one of the resistor connections I resoldered isn't quite right. The 180 degree out MMU foxed me in the beginning I have to say! Thing is, I'm not changing its orientation, I'm leaving it as it arrived. Popping it out of the socket, it appears aligned correctly (I assume: dot along one edge aligns with the arrow in the socket). The resistors that were previously clipped each have 0V across them when running. That's correct, right? The MMU looks like it's in its socket correctly. I cleaned the pins with isoprop, nothing looks out of alignment. These are the obvious things. What's next? Rather than stab in the dark, what should I be looking for? Gut says: the RAM's gotta be the culprit, if I've done a bad solder job. But the pathways I've tested look okay. Next culprit: the MMU not being seated correctly, but it looks okay by eye. What should I look for here? I see reference to bad PSUs leading to these symptoms, and that a recap would help. But I'd prefer not to bodge a recap and give myself even more to debug! To answer some of your questions, if the MMU pins are clean, and the dot on the MMU matches with the dot on the socket, you should use a magnifying glass to check the contacts in the MMU socket are actually touching the pins on the chip. You can adjust them a little to make sure they do, but best to do it with the chip removed. It doesn't take much pressure to adjust them, so take it carefully. As I recall R59 was snipped and fed 5v to disable the first bank of RAM i.e. the onboard 512k. Difficult to say just how good/bad your PSU is. I had a number of working PSUs that would power on a machine, but give all sorts of random errors, particularly on a machine with 'extras' such a an ATonce PC emulator and a PAK 68/2 accelerator board. As soon as I dropped in a known good PSU, all was well again. If I'm honest, what you're seeing is the same as I did for the same board, and it was entirely MMU related, in that the contacts were poor. Figuring you were right, I decided to stop doubting my own soldering. I spent some quality time on the MMU: nudging the pins on the chip out a little. Eventually I realised that the chip sits pretty deep in the socket and while some of the socket pins appeared okay near the top, they definitely appeared bent inwards near the base. Side-effect of sitting in storage with the marpet upgrade for too long? Currently it's open surgery: the drive isn't plugged in, nor the keyboard. But we're off to a start. The machine is alive. Thanks for your help! You're at least in a good spot to start trying to make the RAM upgrade work.